Note: you can do step 3 before step 2 if you want. To assign players to teams you use the Assign Roster link. It is important to make sure you set the filters correctly or you will see players that are not in your league and could end up assigning them to teams that are not appropriate for their grade level or who are not registered in the program. Log into the system at http://www.wwpsa2.org and click on the Admin link in the top right hand corner. Select a Team - pick 2015-2016 in the first drop down and then pick a team from your league in the 2nd drop down on that row. You can’t pick league names you must pick a team. This is the team you will be assigning players too. Currently unassigned in Season – will list people not yet assigned to a team. Use this option if you only want to see people not yet on a team. 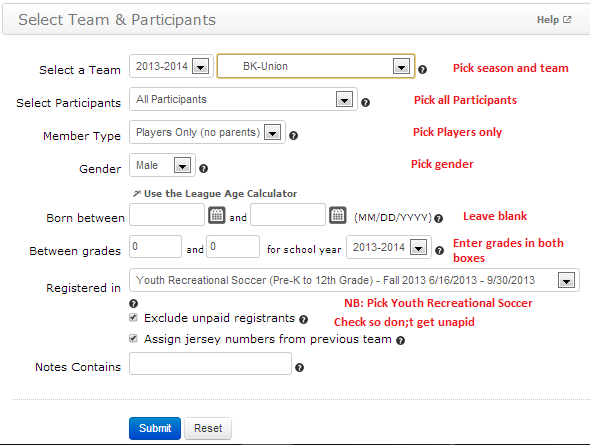 Currently unassigned to Select Teams – will list people not assigned to the team selected in 2. Use this option if you want to move someone from one team to another. All – will include parents and players. Parents are marked with an * after their name. Between Grades – set to the grades for your league. PreK use -1, K use 0, 1 for First Grade, etc. Make sure you fill in both boxes and pick the right school year. Uniform kit – to view which players ordered a new uniform kit - you should not need ot use this. None - DO NOT USE this option it will list all people meeting the criteria you listed including those not playing recreational soccer i.e. it will include travel, TDA and other such players. Check the Exclude unpaid will exclude people who registered but have not yet paid. The system is set up to automatically delete people who have not paid come September so it is best to check this since if you assign them to teams and they don’t pay they will be deleted and the team will end up with one player less. Assign Jersey numbers from previous teams – does not matter to us since we are using this system for the first time. I would leave it checked. The system will then prompt you for other registration criteria. You can use the drop down to pick various data questions and specific what the answer must be for the participant to be displayed. You probably will not need to use this for listing players. Click Submit again and the next screen will list the team you selected on the left side and the unassigned participants on the right side. To remove a participant from a team click on a name under the team name on the left side. Click Save Roster to save the team assignment. If you don’t click Save Roster and exit out all your work will be lost. Everyone assigned to the team will be displayed. Make sure under Poston that you pick the Coach or Asst Coach option for coaches and Players for players and then click Submit to save the roster. If you do not do this the coaches will show up on the roster as players since player is the default option.